A Christmas-shortened week sees the final release of third quarter Gross Domestic Product (GDP) on Tuesday and Core Capital Goods Orders on Wednesday. Markets close early on Thursday for Christmas Eve and are closed on Friday for Christmas Day. 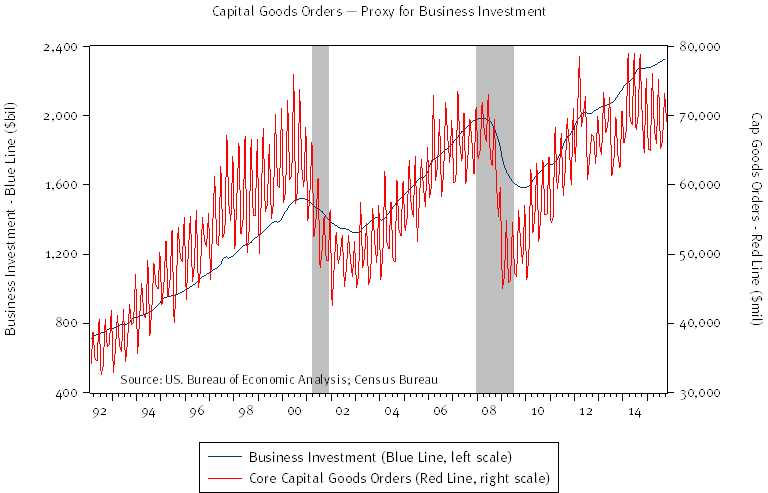 Core Capital Goods Orders could be the best leading indicator of all on business investment spending. Orders tend to decline six to twelve months before an economic downturn and typically rebound anywhere from three to eighteen months after the bottom of the recession (See chart below). The steady climb in capital goods orders that followed the last recession has slowed somewhat through 2014-2015, suggesting a slower pace of growth in corporate investment.